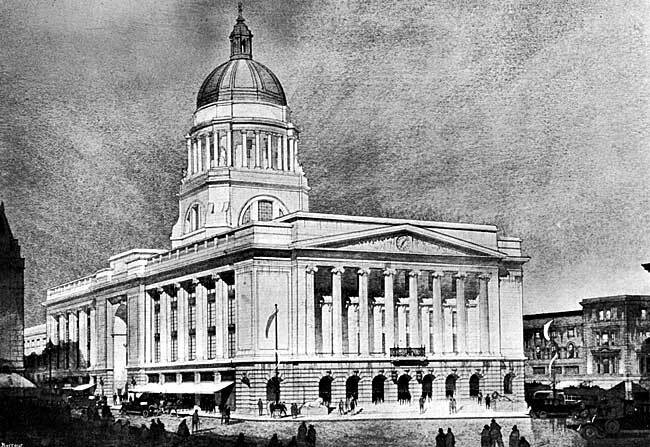 The new Exchange building, Nottingham, as it will appear when completed. [From a drawing by courtesy of the architect, Major T. Cecil Howitt, D.S.O., A.R.I.B.A.). The proud title of "Queen of the Midlands," which the City of Nottingham, the centre of English lace-making, has long claimed as its birthright, is not the expression of a mere idle boast. It is based on the possession of natural, industrial and geographical advantages of which its municpal rulers and citizens are determined to make the most. They realise, moreover, that the "City Industrial " need not be the "City Ugly." Nottingham, with all its industrial and commercial ambitions, has not lost sight of the aesthetic aspect of a great city's growth, and it is accordingly developing into the "City Beautiful"—one of the finest in the Empire. The grime and drabness which one usually expects—and often finds—in a great manufacturing centre are absent from Nottingham. It is remarkably clean-looking and the atmosphere is practically free from smoke. This, combined with an excellent drainage system and an abundant supply of pure water, has helped to give Nottingham a high place for health among the great towns of England. No industrial city in the Kingdom is set in such varied and picturesque natural surroundings as Nottingham. It lies on the slope of a sandy rock at the south-west extremity of the Forest of Sherwood and covers an area of 17 square miles. To the south of the city is the River Trent, the third in magnitude of the rivers of England, which at Trent Bridge has a width of 200 yards. The ground is hilly and grand views of the surrounding country, including the Vale of Trent, can be obtained from many a vantage point. A chain of hills shelters it from the North winds, while on the south it is open to the Vale of Belvoir, the Nottinghamshire Wolds and the Leicestershire Hills. So placed; dowered by Nature with rich mineral wealth and enjoying unrivalled communications by road, rail and water, Nottingham envisages with well-founded hope greater industrial developments in the future than any that have taken place since the beginning of the century. This booklet seeks, among other things, to give the grounds for Nottingham's optimism. Every great city has its own particular "atmosphere." In Nottingham one senses a progressive and up-to-date touch, a "getting-on" air, which is the outward indication of the citizens' confidence in their own skill, enterprise and resourcefulness. This "atmosphere" is also due, in part, to a realization of the supreme advantages of site and environment enjoyed by Nottingham. From its situation on a rich coalfield in the heart of England it is, in fact, naturally adapted to become what it is—a great hive of industry with immense potentialities as well as an ideal distributing centre—a position which it has maintained since the days of the Plantagenets. The prosperity of the city does not depend on a "staple trade," for Nottingham is the "City of many industries." While its pre-eminence in lace-making and hosiery have made the names of the great firms engaged in those industries known in every corner of the world to which English lace and hosiery find their way, there are names in other industries which may truthfully be said to be known " from China to Peru." A special article by the Secretary of the Nottingham Chamber of Commerce, which will be found on page 22 of this booklet, is devoted to a survey of the industries of Nottingham, but the following list will give some idea of the variety of articles manufactured or trades carried on within the bounds of the City: Adding Machines, Basket and Wicker Work, Bicycles, Bleaching and Dyeing, Bone Glue, Box Making, Brass- founding, Brewing and Malting, Bricks, Clothing (Men's and Boys'), Cotton Doubling, Cycles, Engineering (including Electrical, Furnace, Lace and Hosiery Machines and Railway Rolling Stock), Electro-Plating, Embroidery, Furniture, Gloves and Glove Fabrics, Gypsum, Hosiery, Jacquards, Lace, Leather, Ladies' and Children's Light Clothing, Mantles, Mining, Motor Cars and Motor Cycles, Perambulators, Pharmaceutical Products, Pottery, Poultry Food, Printing Inks, Printing and Lithography, Sheet Metal Working, Soap, Spinning, Surgical Instruments and Appliances, Tobacco, Toys, Typewriters, Wire Ropes, Wool and Cotton Waste, and Yarns. The advantages which led manufacturers of such varied products to establish their factories in Nottingham and add so enormously to its industrial development are greater to-day than ever, thanks to vigorous private enterprise and progressive, enlightened municipal administration. Nature has provided, in the large coal mines within the city boundaries, an asset which, of course, has been one of the prime causes of this remarkable progress and expansion. The greater portion of the coal used for domestic and trade purposes can be carted direct from the pit head, thus dispensing with rail and water transport. It is not necessary to emphasize to keen business men the saving in production costs which this implies to industries depending on a large supply of coal. Nature again, supplemented by human skill, has provided in the system of waterways of which Nottingham is the centre, another asset of increasing value, how great may be illustrated by the fact that 160 steel coaches under construction in Nottingham for the Bombay, Baroda and Central India Railway, will be sent all the way to India from the works at Nottingham by water. The complete steel shells will be transported in specially constructed barges via the River Trent to Hull, and thence by special steamers to their destination. To the other assets of cheap power, magnificent roads and splendid railway facilities may be added the fact that it can draw from its population of 262,624 an abundant supply both of good artizans and of girls and women with deft fingers. The type of operatives is superior to that found in the majority of English manufacturing towns. The Corporation of Nottingham are fully alive to the importance of attracting to the City manufacturers who are seeking sites for new works or branches. In the matter of rating, steps are being taken to establish a system of "preferential" rates in the case of new industries, but in the meantime newcomers receive considerate treatment in the matter of assessment and are given ample time to become fully established before being assessed on the full value of their premises. The Town Clerk, Guildhall, Nottingham, invites enquiries and will be pleased to supply all possible information with regard to factories, sites, conditions, and services generally. The Corporation of Nottingham possess extensive estates and are at present erecting the new Exchange Buildings situated in the heart of the shopping centre of the City, bounded by the Great Market Place, Smithy Row, High Street, and Cheapside. 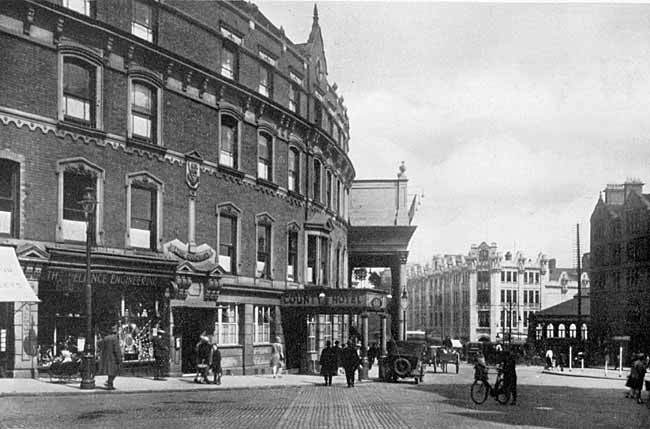 The whole of the ground floor is given over to the provision of handsome shops with basements, and the building will be intersected by two magnificent Arcades. The first to fourth floors over that portion of the building fronting the Market Place will accommodate the Council Chamber, and the Mayor's Parlour. The remaining portion of these floors will be let as show-rooms in connection with the shops underneath, or as offices, etc. The lift service to all floors will embody the latest designs and improvements. The Corporation of Nottingham are the largest growers of sugar beet in the county, this activity being located on the sewage disposal works at Stoke. A large modern factory has been erected at Colwick, just outside the City, for the manufacture of beet sugar.